The German city of Köln (Cologne) sits on ground which can trace its first settlement back to a Germanic tribe called the Ubii who settled here in around 38BC after forming an alliance with the Romans. At the time it was called Oppidum Ubiorum. In 50AD the Romans elevated its status to a Roman Colonia (an outpost of the Roman empire used to secure conquered lands) and renamed it 'Colonia Claudia Ara Agrippinensium' (CCAA) after Agrippina and her husband Emperor Claudius. Agrippina was the mother of the Roman Emperor Nero. Incidentally, he had her killed a few years into his reign. The name Colonia stuck and as the years went on variations such as Colne, Coellne, Coellen, Kollen, Kolne were all used simultaneously. Collen was the favoured spelling in early modern times, but it wasn't until after the first world war that the authorities decided on Köln as the official name. The spelling Cologne is the French version of the name which is also used in English. You may even hear Colonia still being used, especially if you visit during carnival time where the song 'Viva Colonia' can be heard many times each day. It has always been a very well populated city and the current-day figure stands at around 1 million people, making it the fourth most-populated city in Germany. The second world war saw it virtually deserted as it was on the receiving end of 262 bombing raids by the Royal Air Force which almost destroyed the entire city. Modern-day Cologne is a centre of culture in the region and has more than 30 museums and hundreds of galleries. The most recognisable feature of the city is without doubt Kölner Dom (Cologne Cathedral). Construction began in 1248, was halted while in progress in 1473, then started again in the 1840s with it finally being finished in 1880. It is a UNESCO world heritage site and Germany's most visited landmark with more than twice the number of visitors (6.5 million per year) than its closest rival the Reichstag in Berlin. Over the years the city has had four defensive walls in place, but under the Treaty of Versailles German fortifications were to be destroyed. However some sections of the Roman wall have survived, and you can still trace the line of the medieval defensive wall as the main ring roads around the city run along it. Much of the land here is known as the 'inner green belt' which surrounds the inner city, and one of the areas is a park called Hiroshima-Nagasaki Park. Hiroshima-Nagasaki Park was created on land previously used as a dumping ground for debris from the bombed city. It was also used as a place for rallies and could hold up to 200,000 people. Peace rallies were popular and Cologne became part of the Hiroshima-Nagasaki Alliance, which is an international city alliance against nuclear weapons. The Cologne Peace Forum suggested the area become a park in memorial to the two Japanese cities and in 2004 the park was inaugurated. Before the park had a name it was essentially just referred to as the 'green space on the Aachener Weiher' or 'the meadows around the pond'. The Aachener Weiher (Aachener Pond) is an artificial lake, pretty much a perfect square in shape (very orderly, you might say) which takes its name from the adjacent Aachener Straße (this runs along the route of original Roman road 'Via Belgica'), and it is this pond that gives its name to the weekly, 5 kilometre running and walking event that now takes place here - Aachener Weiher parkrun. The inaugural event was on 23 March 2019 and became Germany's 16th parkrun. We were driven into Cologne by my mother-in-law as we were staying at her house about an hour away. We drove along the A4 and as you approach the city you pass the Michael Schumacher Kart Centre before the fantastic panoramic sight of the city comes into view. Once at the venue, we parked the car on the side of Aachener Straße right next the Aachener Weiher, which was of course perfectly convenient. A fee is payable between the hours of 9am and 6pm Monday to Saturday - at the time of our visit it was 0.50 euros per 20 minutes or 4 euros for the entire day. The cycling network looked to be fairly decent, but I can't remember seeing any official cycle racks. There were a couple of metal benches at the start/finish which looked ok for securing a bike to. The park may or may not have toilets depending on when you visit. They seem to have a system of portaloos in place for busy periods (the summer). A sign on the toilets suggested they would be available between May and September. We visited in April 2019 and portaloos were in position at various points around the park. They were free-of-charge to use but if visiting, especially outside of the dates mentioned, it might be worth having a pit-stop en-route. I'd imagine most British tourists would arrive on public transport, and probably via the main train station 'Köln Hauptbahnhof' (Cologne Central Station or Main Station) in the centre of the city. There is a direct train from Brussels to Cologne so it makes it quite a straight forward destination from London using a Eurostar-Thalys combo - I've used this Thalys many times in the past and the best tip I can give here is to pay the extra few Euros and upgrade to first class (standard can be a bit chaotic). As I was staying with family I didn't need a hotel so can't offer any specific advice on this, but being a very popular tourist destination means hotels are in abundance. Once in the centre of Cologne it is easy enough to take the U-Bahn (underground) line 18 to Neumarkt and then the tram line 1 to Moltkestrasse. From there you simply walk into the park and head to the south side of the Aachener Weiher where you will find the meeting point and start-finish area. Of course, you could walk or run from the centre - for the record it's around 2.8km. The briefing is delivered by the Laufleitung (Run Director) next to the pond where you get a superb view of the telecommunications tower 'Colonius' which at 266m is the tallest structure in the city. The runners and walkers are then sent off on their way around this very pleasant inner city park. It takes place over a two lap course encompassing the park and the perimeter of the pond. Underfoot is a combination of tarmac and a light, dusty gravel surface (with a little sand and some decking thrown in for funzies), so road shoes will be fine year round. Also, buggy runners will be just fine here, but it's worth noting that there is a kerb to negotiate a few hundred metres into the lap. The first section is right next to the pond, and after doubling back on oneself at the beginning of the lap, the course heads along the central road which is quite popular for cyclists and actually had some official park maintenance vehicles moving around (worth being aware of this). The lap continues along the meandering paths of the memorial park and features a gradual climb up to the top of the rubble pile which is now beautifully landscaped. The route is sometimes lined with a dense selection of trees and at other times with open grass areas. There are a few tight turns as the course kind of zig-zags its way through the park. The streckenposten (marshals) were strategically placed and were all brilliant. A small section of the path is covered in sand from the adjacent spielplatz (playground) - it was strange negotiating that with a buggy! This is followed by a chicane style width restriction barrier. Keep an eye out for the 'Atomwaffen Abschaffen' (Abolish Nuclear Weapons) memorial stone at the highest point of the route. It features the symbol of the paper crane (Orizuru) which has become a symbol of resistance to nuclear weapons and nuclear war. It is flanked by three trees; a Ginkgo for Hiroshima, a Japanese Cherry Blossom for Nagasaki, and a Black Poplar for Cologne. After meandering back down to water-level, across a zebra crossing (closed road) and over the decking for the Biergarten, there's a three-quarter lap directly around the pond where the route passes the Museum Fur Ostasiatische Kunst (Museum of East Asian Arts) before heading past the finish and back off into the park for a second lap (where I was joined by my son in the buggy). As I was with the kids, we spent most of our time at the back with the Schlussbegleitung (tail walker). Once two laps have been completed, the ziel (finish) can be found alongside the pond in the same place it all began just a short while earlier. Personal barcodes (between us we produced an Australian disc, Polish wristband and British wristband) are scanned along with the finishing token right next to the finish. Once everyone has completed the course and the kit packed away, the team relocate to Kawa Coffee Snacks and Co (just across the Universitatsstrasse road) for some post-event refreshments. The ergebnisse (results) for event 5 were processed later that day and 25 people had participated which is slightly lower than the the average (40) for this event at time of writing. If you are visiting and worried about the language barrier, don't be! The core team are mostly British and so much English is spoken that you might not realise you are overseas - I imagine this'll change as more locals become involved, which will be good for the event. I recorded the course with my Garmin and the GPS data can be found on my Strava profile, here: Aachener Weiher parkrun event 5. I also made a course video using the Relive app on my phone, you can view that, here: Aachener Weiher parkrun course fly-by. After the run, me and my daughter decided to spend some time taking in the sights around the city. We started by finding a medieval gate and a few sections of the Roman Wall before moving on to see the magnificent Kölner Dom, and the Roman Dionysos mosaic floor in the Romisch-Germanisches Museum (viewed from the outside as the museum is currently being renovated). We then had a spot of lunch and finished off by wandering through the Altstadt (Old Town) (rebuilt post-war) and visiting the Shokoladenmuseum (Chocolate Museum). We were almost tempted by the Senfmuseum (mustard museum)! There were countless other things we could have done, like visit the Fragrance Museum where the original 'Eau de Cologne' was created, take a boat ride on the Rhine, visited Cologne Zoo (apparently one of the oldest in the world) or taken in the panoramic view from the top of the Kölntriangle. However there's only so much time in a day and it was soon time to jump on the train back to my mother-in-law's house where we were finally able to put our feet up while having some abendbrot. The country estate of the Locke King family once dominated a large part of the southern area of Weybridge, Surrey. Its centrepiece was the family mansion, which was built in 1861 by Peter Locke King. Interestingly, the estate was formerly owned by Prince Frederick, Duke of York and Albany - this is THE grand old Duke of York, yes, the one from the nursery rhyme. Upon Peter's death in 1885, the estate was inherited by his son, Hugh Locke King. Hugh had a passion for automobiles and came to the conclusion that Britain should have its own motor testing track in order to assist the motor industry to develop, and to keep up with the progress the European motor car producers were making. So he went ahead and built a 2.75 mile (4.43km) oval-shaped racing track with banked sides within the grounds of his estate. This was the first purpose-built racing tack in the world. It's name was Brooklands. In 1909 an aerodrome was added and Brooklands became the centre of the British automotive (motorsports) and aeronautical industries. All the big names of the day had their own warehouses, workshops and offices here. Tyre companies found the track especially useful as cars could be driven at top speed continuously for however long was required. Malcolm Campbell, famous for setting the land and water speed records in his Blue Bird vehicles during the 1920 and 1930s also had a workshop here. The aerodrome was one of Britain's first airfields and within a few years had become home to numerous flying schools. With the onset of World War One, the facility was requisitioned by the War Office and the Vickers Aviation Ltd set up a factory where military aircraft were constructed and tested. In 1920 motor racing was resumed at Brooklands and the first and second British Grand Prix were held here in 1926 and 1927 respectively. The Hawker Hurricane fighter aircraft was assembled and tested at Brooklands in the years leading up to the Second World War, and when war broke out, Brooklands once again became a military site with the Hawker and Vickers factories producing wartime planes such as the Wellington and Warwick. The famous bouncing bomb used by the Dambusters was designed here by Barnes Wallis. Bombing raids by the Luftwaffe took place in 1940 and by the time the war ended, the track was in such poor condition that motor racing was never resumed here - the last race having been held in August 1939. The post-war years saw aircraft production increase with the Vickers-Armstrongs conglomerate purchasing the site and produced military and commercial planes. In 1960 the company was merged with three other aircraft companies which together became the British Aircraft Corporation (BAC) and Brooklands was heavily involved in the production of Concorde. In total well over 18,000 aircraft were produced at Brooklands between 1908 and its closure in the late 1980s. Some sections of the original track became lost to various developments, but around two-thirds of it are still largely intact, albeit somewhat overgrown in places. This is mostly thanks to a 1975 preservation order which granted the remaining sections of track, buildings and structures protection under the law. The Brooklands Museum Trust was set up to manage and preserve the area and the museum itself opened in 1991. 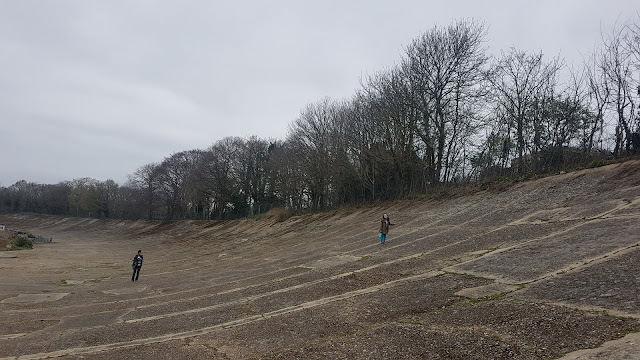 In 2009 Brooklands was featured in an episode of James May's Toy Stories where he and around 300 locals successfully created a Scalextric track which followed the line of the original track. With a total length of 2.953 miles, this set a new, and at time of writing still current, world record for the longest slot car track. The south-eastern corner of the site is now Brooklands Community Park which was created as part of the Mercedes-Benz World and the Brooklands hotel project (more about these later). 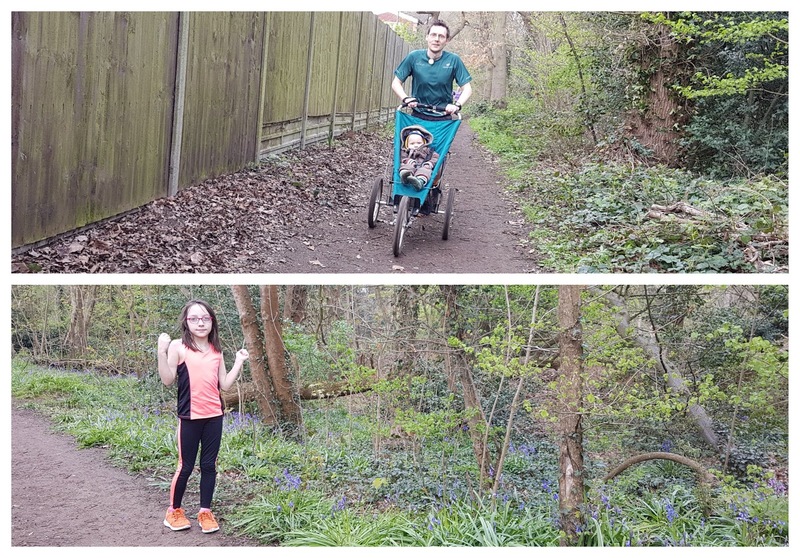 Opened in the mid 00s, the 60 acre park contains a mixture of features including part of the former runway, the 'Byfleet Banking' section of the race track, woodland, children's playground, and a path alongside the River Wey. If you look closely you will find a selection of historic traces of the past like the 'Bayliss' iron railings which marked the original site boundary line. 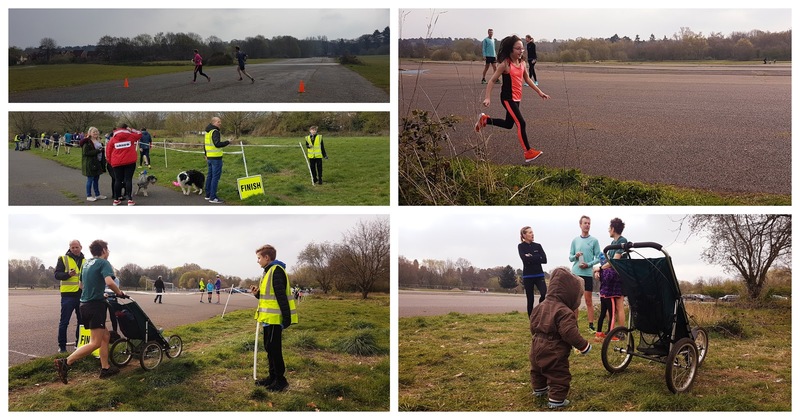 In November 2018 the park became home to a free, 5k walking/running event called Brooklands parkrun. 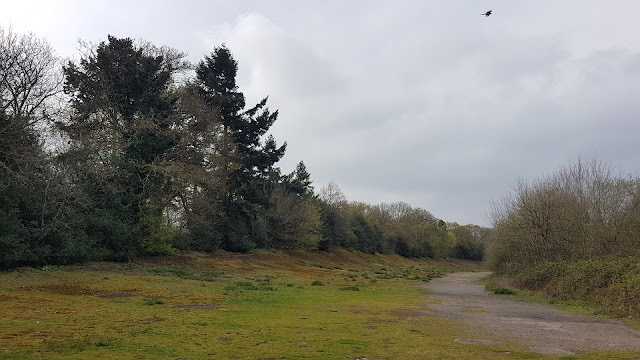 Parking is available in the free-of-charge Brooklands Community Park car park (height restriction of 2.1m) which is at the southern end of the park just off Sopwith Drive. There are no toilets within the park itself but the local Tesco which is just across the road does have some (on the right next to the main entrance, plus more upstairs in the cafe). Tesco's car park also serves as a secondary option in case the main car park has filled up. For anyone travelling by train, you'd be looking at alighting at Byfleet and New Haw station which is just over a kilometre walk away. The meeting point for the event is at the shelter next to the basketball court right in the middle of the former runway, just a couple of minutes walk from the car park. If you happened to have cycled to the event, the shelter has some bicycle racks but if these were unavailable you could always secure it to the playground fencing. The run briefing takes place here, before the whole field relocates to the northern end of the park, which is in sight of the 40% scale model of Concorde which acts as a Gate Guardian for the Brooklands Museum complex. The two-and-a-bit lap anticlockwise course contains a mixture of hard surface (tarmac/concrete) and a softer dirt path for a section through woodland (the split overall is roughly 3.5km / 1.5km). The course itself is entirely flat with the exception of a short, sharp slope within the woodland area. It's absolutely fine for buggy runners here, but you could end up with slightly muddy wheels during the wetter months. With that in mind, if conditions have been particularly wet you may find a light-ish trail shoe would assist at points, but keep in mind that the majority of the course is road shoe territory (For the record, I wore my light trail shoes to be on the safe side, but it had been quite a dry spring and I would have been fine in my road shoes). The route itself starts on the former runway and heads south before crossing the Byfleet Banking section of the race track. Now entering the wooded area, this is where the surface changes underfoot to dirt/mud. It's peaceful in here and I felt quite relaxed as I plodded along with my son in the running buggy and my daughter chatting away to my side. We even spotted some bluebells growing under the trees. The path meanders gently until it eventually reaches a small wooden bridge that crosses a brook. Look out for the historic iron Bayliss iron railings around here - if you look closely you can see where the trees have grown and consumed parts of them. 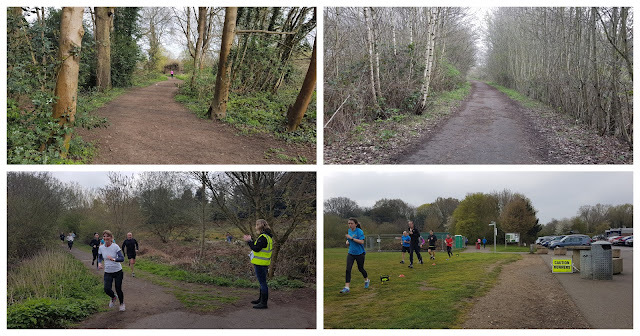 After short section alongside the River Wey the course emerges from the woodland, the surface changes back to concrete/tarmac and participants now cross back across the race track - don't forget to have a sideways glance where you can admire the historic Byfleet Banking. The course heads alongside the track and in between two more brooks (you now get an idea why this area is called Brooklands) for the next 500 metres. Heading back onto the runway, the course heads north along the eastern side of the tarmac and after a short diversion around some cones, heads back around to the start. You'll get a decent view of the Concorde model when the trees are bare, but when in full bloom it may be difficult to spot. The second lap is identical to the first, and the finish line is just a couple of hundred metres further along the tarmac. It's worth noting that the runway area is, as you'd expect, quite exposed, so you're likely to feel the effects of any wind. Barcode scanning is taken care of at the finish line and the team currently head over to Tesco's Cafe for post-event refreshments. The event has been pretty popular from day one and after only 21 events, the average number of attendees is 272. The results were processed in due course and 282 people took part. I, as always, had recorded the course using my Garmin and you can view the course in further detail on my Strava page. You can also watch the Relive video of the course which was created from the GPS data. With the parkrun done and dusted, we continued onto the next part of our day out at the track where we visited Mercedes-Benz World. As I touched on above, this was a project in the early-mid 00s and Mercedes offer a selection of driving experiences at various prices, the most expensive is about £1,200. However there were other, more affordable options. However, even of you are not a paying customer, you can go in and view a selection of new and historic Mercedes-Benz cars. The highlight for me was seeing the three Formula 1 cars on display up on the second floor. The Brooklands Hotel is just next door and has design features that reflect the area's past, it also pays homage to the Solomon Straight (part of the Campbell Circuit, not the main loop, and apparently named after a goat) which runs straight through the main lobby in the form of a line permanently set into the floor. Something I've spotted which I can find absolutely no evidence to support online is that from above the building looks like the shape of a V8 (or V10 or V12) engine, which are typically found in high-end sports cars, The cylinders are arranged in the V shape in order to fit more of them in the available space, this means more power can be produced (anyway, something like that. I'm not an expert). 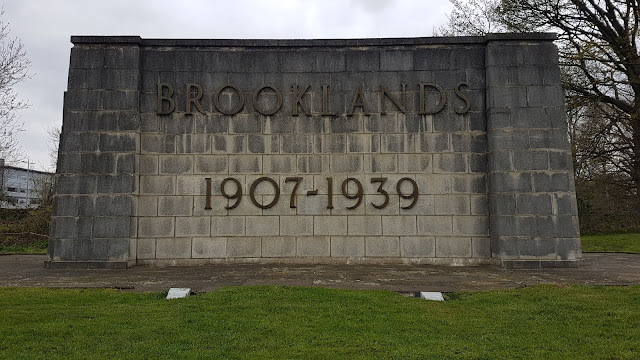 Following that we went into the Brooklands Museum where the entry fees are £16 for an adult and £9 for a child. Many highlights here including seeing the Concorde (a family friend's grandad worked at Brooklands and was involved in producing the parts), the Napier-Railton (which holds the fastest lap record at Brooklands), sitting in the cockpit of a Harrier (Jump Jet), and seeing more Formula 1 cars. 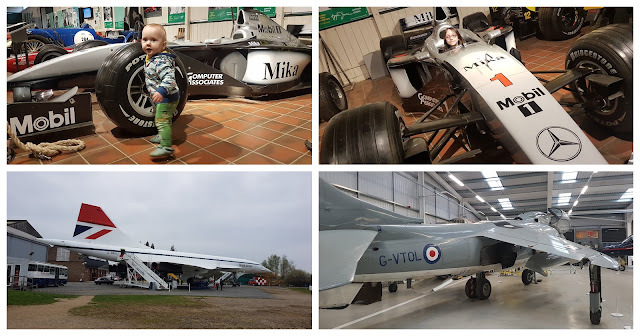 The museum staff allow children to sit in one of the F1 cars (it's children only as the steering wheel does not come out to give adults the space to climb in), so my daughter got to sit in Mika Häkkinen's World Championship winning McLaren MP4/14 (Being on F1 fan, I may be slightly envious!). By the end of the day we were totally shattered, but we'd all had a fantastic time at Brooklands and have it in mind to go back and do it all over again sometime in the future! 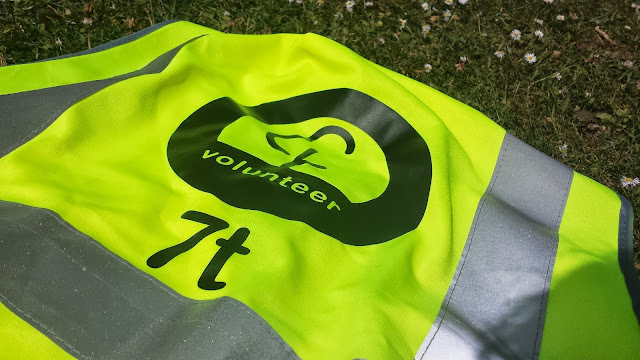 I've taken on most of the volunteering roles at parkrun multiple times, so here are some tips based on what I've picked up over the years. Please note, these are only my tips. There are official parkrun web pages that explain the exact roles in detail. Plus each event will have local variations that will need to be taken into account. Prepare some notes to refer to during the briefing. Delegate as much as possible to ensure you are free to deal with bits and pieces that pop up on the morning. If you have the electronic bits and pieces, make sure the data is cleared from the previous week and they have sufficient charge in the batteries. A core team member role which is likely to be ongoing or repeated due to the nature of the role. I've never been totally responsible for this role, but of course you'll need to be good at planning ahead and ensure the roles are sufficiently covered in time for the event. Don't be late with the kit on the morning of the event. This tends to be a role that specific people seem to repeat, so team up with someone that knows exactly where everything goes while you learn the ropes. There might be signs that go in places participants don't see, so don't just assume you know where they all go. Have a copy of a barcode, a directional arrow and a finish token to give visual representations of what you're explaining. I have never done this, but you'll need to know the course in advance and you'll need to be fit enough to ensure you can stay in front of the lead runner. Bear in mind that the lead runner could, in theory, be running at a sub-14 minute 5k pace. That's under 3 minutes per kilometre. Pick a pacing time that is well within your abilities. Know the mile/kilometre markers of the course, and know when you are due to reach each one. Use your Garmin as a guide but also use the kilometre/mile markers to check your progress. Know the course - some courses could be slightly long or short, or be hilly, which could make a difference to the way you pace your pacees. Pacing can quite often be an art. Stick to the plan even if it feels like nobody else is with you - somebody could be way behind, but keeping you in sight as an indicator of how their doing. I've never been a VI guide, but I expect if you are doing this you would have had some training beforehand and will know more than I do anyway. Remember you are there to perform a function, not to just look pretty and cheer. Direct all participants even if they appear to know the course. Look out for other park users and give them a heads up that a large number of people may be heading their way - be mindful of the wording used. Stay right at the back - so many times I have seen an event start and the tail walker isn't behind the last person. Keep an eye out for late starters during the first few minutes. Don't feel obliged to stay right with the last person and make conversation - they may not want to. Remember that this role will take as long as required, so only take it on if you know you don't have to rush off at a certain time. Know the course well, and know the positions of the marshals in case of emergency. Be cautious of taking on the tailwalker role at an unfamiliar venue just to get a volunteer credit. I find that when two people are timing, it is easy to hear the other timer's beeps as they click participants in, which can be mistaken for your own. I hold my stopwatch close to my ear to ensure I clearly hear my own beeps - I've never made an error using this method. Keep an eye on the incoming participants so you don't get caught out by a large pack all arriving together. Stay on your toes during the peak finishing period. A lot of people are not thinking straight when they cross the line and may need some gentle coaxing to stay in order and take a finish token. Keep an eye on how many people are approaching the finish and ensure you have a good flow of tokens. Be familiar with the procedures should you drop tokens etc..
A post-event role, which should be nice and relaxing. Simply sort the finish tokens back into the correct order ready for the next event. Record discrepancies occurring between the timers and tokens. Keep a good distance between barcode scanners as the beeps from the other(s) can be confused with your own. On sunny days, turn your body in order to keep the barcodes in the shade. Make sure you only clear away signs once the tail walker has passed them for the last time. Liaise with timers, finish tokens and scanners and make sure any issues have been noted. This will make the job easier. If posting to inform that results or news articles are ready, make sure to add a link. When linking to the results, use the exact link to that week's results page (ie don't just link to the latest results page). Do the same for the news page. A bit of everything (stats/facts/stories) seems to work well. People love being mentioned, so namedrop as often as you can. With 240 acres of parkland and woodland, Foots Cray Meadows is the largest open public space in the London Borough of Bexley. It spans both banks of the River Cray as it weaves its way through both Foots Cray and North Cray. The area is also a Local Nature Reserve and a Site of Metropolitan Importance for Nature Conservation. Foots Cray itself is largely industrial with the biggest name company to have a factory here being Coca Cola. The area takes its name from a Saxon landowner, Godwin Fot, who held the Kentish Manor here during the reign of Edward the Confessor. The Cray part comes from the river. The Cray Valley, as it is sometimes called, was a popular place for 'gentlemen's retreats' during the 18th century and two of these originally occupied land that now forms the park. Firstly there was Foots Cray Place which featured a palladian mansion, this replaced an earlier estate called Pike Place whose centrepiece was an Elizabethan E-shaped house. On the North Cray side there was North Cray Place whose grounds were landscaped by Lancelot 'Capability' Brown in c.1780 and some of his work can still be seen as you will find out below. The most recent house dating from 1760 is still standing. Once known as Woollett Hall it is now called Loring Hall - interestingly, in 1822 the Foreign Secretary Viscount Castlereigh, who owned the house at this time, commited suicide here. Anyway, we were here for Foots Cray Meadows parkrun which started in July 2018. Had I been here alone, I would have cycled or ran the 6km from home. Alternatively, I would have taken the train to Albany Park station and walked the rest of the way. Incidentally I quite often alight the train at Albany Park on my way home from work and run the rest of the way home (those that follow me on Strava will sometimes spot entries named AYP-DFD). On this particular day, all four of us had decided to take part so we jumped in the car and headed to Woollett Hall Farm which is where the official car park and toilets are. I would advise checking the course page for comprehensive driving directions as those unfamiliar with the area could be caught out otherwise (hint: there's a dual carriageway which requires you to do a u-turn if you are approaching from Bexley Village). On the subject of the farm, it's worth pointing out that there is a campsite here and showers are available at the cost of £1 for 10 minutes. From the farm there is a 5-10 minute walk to get into the park, so make sure to leave plenty of time to find your way along the country lane and footpaths that lead across the river and into the park. Once in the park, you will spot the playground and then the huddle of fellow participants and the hi-vis jackets of the volunteers. The run briefing takes place on the open grass area which is known as Royal Park, and following that the crowd gather on the spacious start line. The course consists of an 'out' section, followed by a large loop, then a small loop, before heading back towards the playground. Underfoot is mostly grass, and despite the ground having a few uneven spots, buggy runners would generally be ok here. However, it is worth noting that the park is used for one of the Kent Cross Country League races, so expect a softer, or even muddy, surface during the winter. Road shoes will easily see you through the summer, but trail shoes would be the better option during the winter. 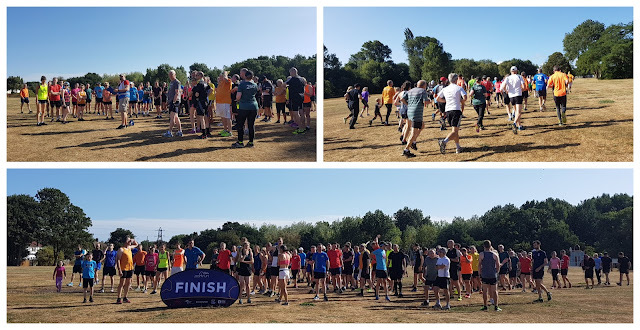 With the run underway, the course heads in a south-westerly direction across the open grass before picking up a more defined dirt path that leads onto North Cray Meadows. Interestingly, although the whole area is called Foots Cray Meadows, each part still retain its own historic name. Continuing in the same direction, the route passes Lancelot 'Capability' Brown's stunning 'Five Arch Bridge'. The course is basically flat, but there is the slightest rise in elevation when heading towards the southern and western end. Before long the course arrives at the southern end of the park and passes through Wet Meadow while the participants head straight towards the spire of All Saints Church in the distance. Now on Foots Cray Lawns, the route now turns to the north and follows the edge of Chestnut Avenue. This section requires some self-discipline as the course now hugs the side of the avenue of trees towards cones in the far corner. However a few of the participants in front of us clearly, but maybe not intentionally, cut a huge chunk off the course by heading straight across the grass. After weaving around a little more, the course enters North Cray Woods which are officially listed as Ancient Woodland. They can be traced back until at least the 12th century, and may even pre-date the Domesday Book of 1086. Underfoot up to this point had been grassy, but changed in the woods to softer dirt and then to an ever-so-slightly downhill, gravelly avenue which leads back towards North Cray Meadows. This completes the large loop and a smooth tarmac path leads back in the direction of the bridge where the smaller loop begins. 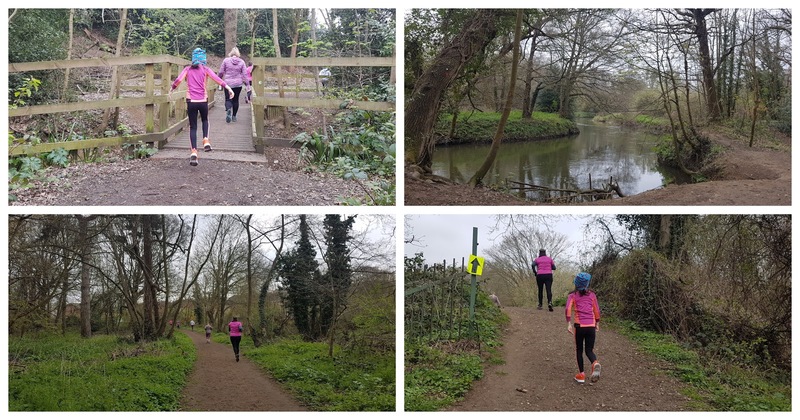 The smaller loop cuts off most of the southern end of the course by taking participants along Lime Avenue - this leads through the central area of Foots Cray Lawns, and at the end, the course heads back through the ancient woodland. Upon reaching the tarmac path for a second time, the route now heads straight across and right through North Cray Meadows where you'll find wildflowers growing on either side of the mown grass path. Before you know it, you have rejoined the original 'out' section and it's just a simple case of following this back onto the open grass fields of Royal Park. The finish funnel team will be awaiting your arrival at the finish with the barcode scanners in position just beyond. Once all of the day's participants have completed the course the focus of the event moves back to Woollett Hall Farm, or more specifically, to Kelsey's Farm Shop which is where the post-run social gathering takes place. After sampling the veggie sausage rolls and chocolate brownie, I popped into the farm shop to buy a Five Arches summer ale (very fitting, I thought) which was brewed locally at Bexley Brewery - if you fancy doing the same you may have to visit during summer as it is part of their four seasons range and may not be available all year round. It turned out to be Danny Norman who has just 'got the old band back together' (the rest of the band being Nicola Forwood of course) and launched a brand new unofficial podcast all about our favourite Saturday morning pastime. You can follow the podcast on Facebook or Twitter, plus the link to the show is in the update below. Update: Click here to listen to With Me Now, episode 3 - 'Poodos'. It can also be found on itunes. Also, it transpires that Danny didn't actually say 'with me now', so it seems that I was distracted by the sweetcorn crops and wasn't actually paying attention! The results for event two were published pretty quickly after the run and 146 people had taken part. I had recorded the course with my Garmin and the GPS data can be viewed on my Strava account. You'll also find a Relive course fly-by video on my youtube page. We came away having thoroughly enjoyed our visit and it's certainly local enough to swing by for a return visit in the future.